Lesser prairie-chicken range occurs in five states in the southern Great Plains: Colorado, Kansas, Oklahoma, New Mexico and Texas. Colorado has a relatively small portion of the overall range of the species and thus relatively less enrollment in the range-wide plan than other states; however, every little bit helps. CPW conservation biologists are preparing to head into spring lek counting soon, where they will estimate populations in Colorado based on the number of males present in known breeding areas, or leks. Aerial surveys are also conducted by WAFWA to estimate the total range-wide population of lesser prairie-chickens. David Klute, CPW's Species Conservation Unit Supervisor, is optimistic about what the biologists will find. "Moisture in the areas where lesser prairie-chickens are know to inhabit has risen again this year, and usually ample moisture means improved habitat," said Klute. Klute was quick to point out that no analysis or conclusion can be made until the data is gathered and his team has time to identify population trends. 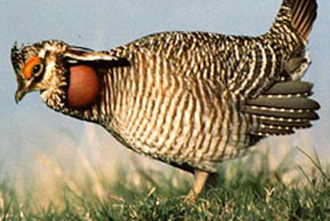 Learn more about the success of the Lesser Prairie-Chicken Range-wide Conservation Plan at www.wafwa.org.